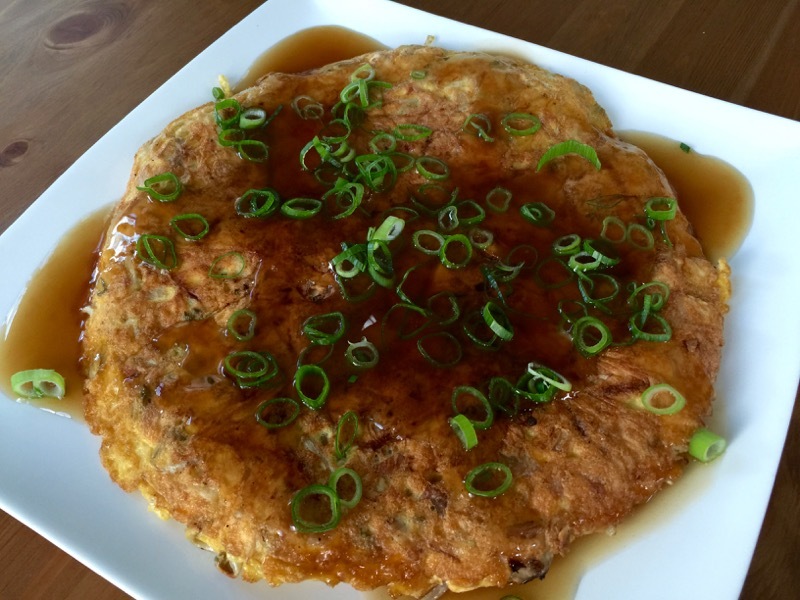 While deciding what to create for the site this week, I couldn’t believe I’d never recorded my egg foo young recipe. You can use corn starch rather than tapioca starch, though tapioca does provide a cleaner-looking sauce and slightly different texture. Without further ado, here’s a protein-packed meal you can scratch make faster than the Chinese food delivery driver can get to your home. Place two frying pans of equal size on medium heat. In a bowl, whisk together the eggs, onion whites, salt and pepper. Stir in the bean sprouts and chicken. Add the oil evenly between the frying pans and swirl to coat evenly. Pour the egg mixture into one of the frying pans. Cook covered for three minutes. Carefully place the frying pans face to face and turn the egg foo young from one pan into the other to cook the other side. Cook covered for three minutes. Remove from heat and turn the egg foo young onto a plate. Place a small pot on medium heat, adding the chicken stock, oyster sauce and sherry. Bring to a boil. In a small bowl whisk together the tapioca starch and water. Whisk the slurry into the stock mixture and remove from heat. Pour the sauce over the egg foo young and serve garnished with the onion greens.